This page describes some organised mistletoe events and activities, and outlines opportunities for other activities. It includes the events of the Tenbury Wells Mistletoe Festival, and events organised by the druidic Mistletoe Foundation. The Mistletoe workshops run by Mistletoe Matters are also included where these are open to all. This website is being rebuilt in Summer 2015. To visit the new site (not yet complete) click here, otherwise browse the existing site. Please note that this page does not list talks booked by, and only open to, individual societies and clubs (wildlife groups, gardening clubs, history societies, WIs, U3As etc). If you want to book a mistletoe talk, walks or workshop for your group please visit our talks page for more information. Mistletoe is very much a winter plant - so most mistletoe activities are centred around mid-winter. The mistletoe berries only develop their distinctive pearly-white colour in November, and harvesting for the season begins soon afterwards. 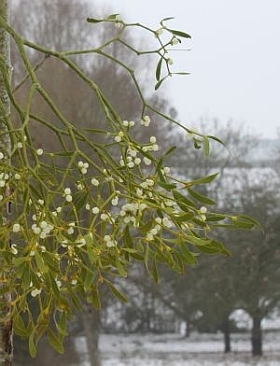 Most UK mistletoe grows in the south-west midlands, and is harvested from traditional apple orchards there. Mistletoe sales occur in the same area from late November into early December. Most of the mistletoe harvest is used for decoration, and kissing under, over the Christmas and New Year season, but mistletoe activities can continue right through to March. Ongoing management of excessive mistletoe growth (it can damage its host tree) is best done during winter, and the February-March period is the best time for planting mistletoe seeds. This is also the period that mistletoe produces its flowers. After pollination these slowly, over the spring, summer and autumn, develop into the new berries for the following winter. We have been running mistletoe workshops since 2005 for a variety of groups and organistions - including orchard conservation groups, the National Trust, BTCV and the Wildlife Trusts at sites right across southern England and Wales. Themes have ranged from mistletoe management and harvesting right through to new mistletoe planting and conservation work. Some have been a mixture of all these subjects. Most workshops take place in early spring and most are orgnaised in conjunction with other groups. The picture above (by Henry Johnson) shows an event at Days Cottage in Gloucestershire. If you want to arrange a specific workshop for your group please visit our talks page for more information. Tenbury's Mistletoe Festival began in 2004, when the traditional Mistletoe Auctions, held in the town for over 100 years, seemed threatened with closure. Local people were determined Tenbury's Mistletoe legacy would c ontinue, and so the Festival was born. Events are centred around the auction season, from late November to early December. They usually include the crowning of the Mistletoe Queen and a druidic celebration of mistletoe. More details are available on the Festival website. Tenbury's traditional mistletoe (and holly) auctions had to leave the old livestock market site in 2006, relocating to a rural site over the border in Herefordshire. But in 2010 they returned to the edge of town. The Auctions are run by Nick Champion - for details about buying or selling please contact Nick via his website. Auction dates for 2014 will be Tuesdays 25th November, 2nd December and 9th December - all taking place in the morning. The Mistletoe Foundation is a druidic group celebrating mistletoe in the druidic tradition. It has no formal membership, and is not affiliated to any Orders or Groups, but is "open to all Druids, botanists and anyone else that loves this sacred plant". Started in 2004 in the Forest of Dean, and run by Stefan Allen for the first few years, the MF was later co-ordinated by Suzanne and Jake Thomas, who ran MF events at the Mistletoe Festival in Tenbury Wells. For background information on the Mistletoe Foundation visit their website or their facebook page. 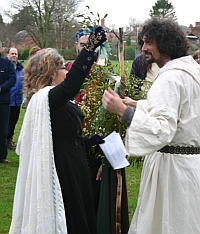 In 2014 there will be a druid ceremony in Tenbury on 29th November. Mistletoe Matters is run by Jonathan Briggs, based in Stonehouse, Gloucestershire, England. © 2011 Jonathan Briggs/Potamogeton Press. All rights reserved.